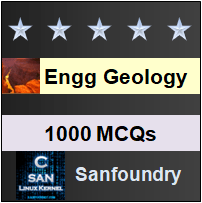 This set of Engineering Geology Multiple Choice Questions & Answers (MCQs) focuses on “Classification of Folds – 01”. Explanation: Anticlines are defined as those folds in which the limbs dip away from each other at the crest in the simplest forms. Explanation: Synclines are the reverse of anticlines in all details and the strata are downarched, that is, these become convex downwards. 3. Which of the following is not true about Anticline? Explanation: Anticlines are said to convex upwards and not downwards. Synclines are convex downwards. 4. What is the other name for upright fold? Explanation: Symmetrical folds are also called normal folds or upright folds. In such a fold, the axial plane is essentially vertical. Explanation: In recumbent folds, one limb comes to lie exactly under the other limb so that a drill hole dug at the surface in the upper limb passes through the lower limb also. 6. Which of the following is also an overturned fold? Explanation: Recumbent folds are described as extreme types of overturned folds in which the axial plane acquires an almost horizontal attitude. Explanation: Box fold may be described as a special type of fold with exceptionally flattened top and steep inclined limbs almost forming three sides of a rectangle. Explanation: When it comes to fold angle as the basis of classification, the fold with fold angle between 10° and 90° is called tight fold. 9. Which of among the following is not a type of fold based on behaviour with depth? Explanation: The first three options are the types based on behaviour with depth where asymmetric fold is based on position of axial plane. 10. Isogans converge inwards in class 1 folds. State true or false. Explanation: In class 1 folds, isogans converge inwards whereas in class 3, these converge upwards. 11. Where can folds be observed in the southern part of India? Explanation: Among the peninsular mountains, only the Vindhyan and the Satpuran ranges show folding in a prominent manner. .
12. Where is the Liddar Valley Anticline situated? Explanation: The Liddar Valley Anticline in Kashmir Himalayas is often represented as a classic example in that almost complete sequence of Palaeozoic Era is fully developed in this anticline.